I have mentioned tilt-shift photgraphy before with the Monster Truck Rally [^]. Well now everyone can turn their own photos into something similar with the tilt-shift generator [^] at Art&Mobile. All I need to do know is go and dig out some more suitable photos to play with. This is my first attempt, a photo of a MET liveried AEC Bus. 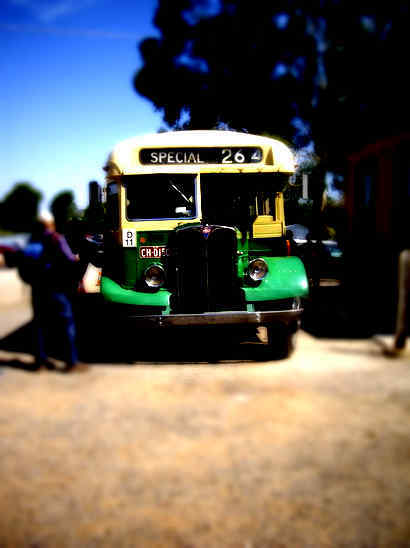 The bus was was running a shuttle service between the Yarra Valley Railway’s [^] Healesville station and the Healesville Memorial Hall during the 2009 Healesville Railway Show. This Melbourne & Metropolitan Tamways Board AEC Regal III was in service on Melbourne’s inner city routes from the time it was built in the 1953 through until the mid 1980s. The bus still has the posters and advertisements that it would have had when it left service with the MET, which is in itself a practical history lesson.